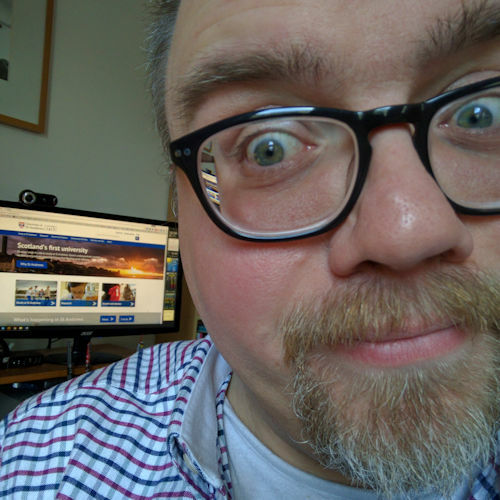 Installing broadband … it’s child’s play! 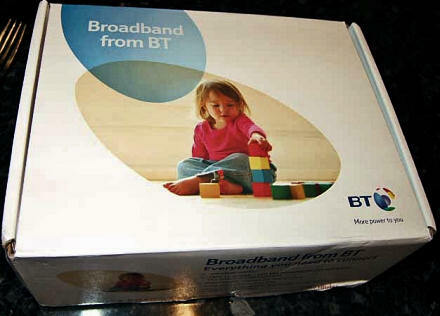 BT Broadband Self-Install box, similar to the one that Peter and Dorothy received. The trouble with BT Broadband Self-Install kits in this family is that what it really means is “Gareth-Install”. Feeling a little brighter this morning I drove down to Jane’s parents and sat behind her Dad’s desk and installed their 2Mb broadband package for them. But … not without a couple of hitches first! One of the great things about computers these days is that alot of the instructions that come with them are so user-friendly. The BT broadband installation is not exception. Pop the CDROM in the drive, turn on the sound and sit back while a seductive female voice lures you into a false sense of hope as she talks you through plugging in ADSL microfilters, powering on the BT Voyager 2091 modem/router/wireless access point, plugging in the ethernet cable, and finally once the software has installed connecting the ADSL cable to make that all-important connection from the Big Blue Everything to your expectant computer. “Sure,” I almost purred back at her, clicked the Reboot button and … And when it restarted: nothing! The Big Blue Nothing. There is something satisfying, and yet at the same time inherently annoying with Windows about knowing that 9 times out of 10 whenever I reboot the computer and about every peripheral situated within a 20m radius of it it’s likely that the problem will have fixed itself when it wakes again from the dead. That’s what fixed it: I powered down the PC, powered down the Voyager 2091 — the name alone made me feel like I was doing some important mission for Space Cadets — and then powered them back up in reverse order. Would you believe it: it worked! Oh, and for some reason I didn’t have to use the Connect to BT Yahoo! Broadband logon button, as the instructions had promised. It just connected. I’m not complaining, the simpler is it for Jane’s folks the better. I got WiFi setup, with a bit of WEP encryption, setup email and opened a new MSN Messenger account for Jane’s folks and then cleared off home for a rest. Posted on Friday 16 December 2005 Monday 25 June 2018 Categories ComputerTags broadband, Computer, PC, trouble-shooting6 Comments on Installing broadband … it’s child’s play!